Y’all, this might be the best… fastest, cheapest, eye-pleasing-est party decorating trick ever. You can literally make this Tissue Garland that I made for Clare’s Buggie Birthday an hour before your party starts when, eh-hem, you should be showering. Click here to get the so easy DIY for Tissue Garland. These directions are for the flower garland that I made but you could easily make squares, circles or pennants… any shape really! Ooooh snowflakes! 2. Fold a few sheets up until the short width is the width of your large flower (mine were about 5″) and then cut off the extra. Cut through the folds on all sides so you have a stack of squares. 3. The extra becomes your smaller flower. Cut it square. Cut through the folds on all sides so you have a stack of squares. 5. Cutting through all layers at once, cut the top into the rounded curve of one petal. 7. Repeat with the rest of your tissue squares. 8. Arrange your stacks of flowers by color and size next to your sewing machine. 9.And start sewing! Just place one flower into your machine and start and as that flower finishes slip another flower in. You can leave a bit of space between or overlap the flowers. I will overlapped even more next time. Perhaps even sew through multiple layers at the same time and fold them to create 3-D flowers. Note: My machine did best on a standard stitch length (2.5), when I tried a (5) it started to bunch. If you are having trouble with bunching, you can pull the tissue from the back of your machine (gently) and it should stay smooth. The strands are so light that you can easily hang with tape. They look great on windows! This was so fast and easy and it added alot to the party! great idea with big impact. Looks very pretty and easy to make! Very pretty! Thanks for the tutorial. I hung fabric on one wall of my daughter's bedroom and have been at a loss as to how to hide the seams/staples. I will use this idea to cut out felt flowers (one at a time, of course)! What a time saver. Thanks again! These are so pretty! I am going to keep this in mind for my daughter's birthday in August. Great idea. My little one is having a fairy garden party; this will make a huge impact! Thanks. perfect for our Hawaiian luau next week! I love this idea. Actually, I love all the ideas from the Buggie Bash. Our daughter turns 3 in September and she has always loved spiders and moths (!?). I will be using some of these ideas. Thanks. ETA: woops, put the wrong link in! Thank you so much for this tutorial! I used it to make a butterfly garland for my daughter's Fairy party! (here: http://tuffetblog.blogspot.com/2010/07/costume-party.html ) The kids really liked the fluttery butterflies and I really liked how easy and, ahem, inexpensive it was! Made a huge impact for not a lot of pennies! Thank you so much! Our kiddo celebrated her 2nd Birthday and loves the WonderPets. We had a little party for her friends and their parents. Mr. J doesn't like everything so coordinated and matchy-matchy, so this garland was festive without say, "Hi! We bought out all the licensed stuff at the Party Store!" Hurrah! 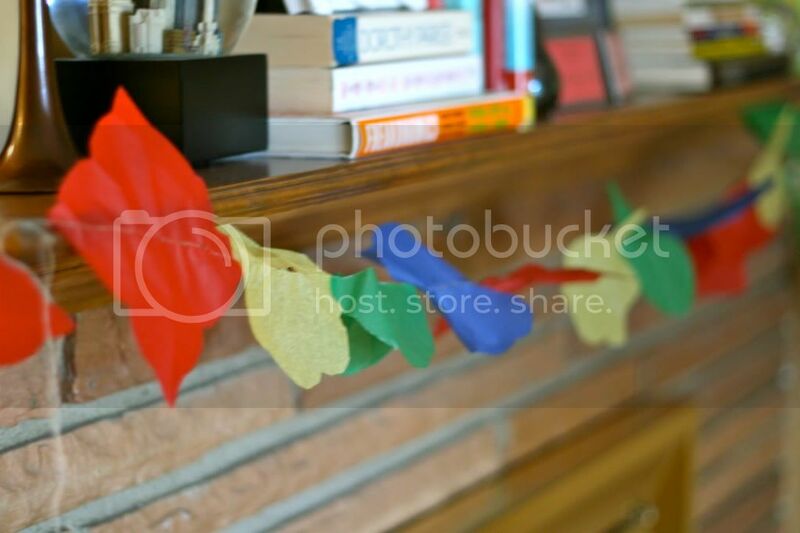 These garlands look so fun (& inexpensive)! I featured you here. So clever! Thanks so much, I am definitely using this for our upcoming first birthday party. My daughter's birthday is the Spring Equinox, so it works with the Spring theme! I have made these for my daughters party tomorrow – thanks. It was really easy and they look great! Okay…So I'm trying to make these right now, and I'm having problems. I feel like a dork. I'm not getting a flower when I cut…Just a circle. What am I doing wrong? Perhaps I'm not understand the fold in thirds part. Hi Amy! You probably just need to cut more of a curve. Like a single petal. Deeper down on the sides. good luck! So so pretty thanks so much for the tutorial! It took me a couple of tries to get the flowers to come out just right but I finally got it! eclccqsvefoucbcz, bars in los angeles, aUzNuFd. fowihqsvefoucbcz, Buy ambien online canada, bFoOzFb. weblfqsvefoucbcz, nyc personal trainers, AtFTyGY. idhxsqsvefoucbcz, Va Streamline Refinance, rwrdayx. udiptqsvefoucbcz, movie theater houston, sNBWmCa. vgwqkqsvefoucbcz, community college in texas, cAZgZYi. PLEASE HELP……. (beginner sewer) I have cut out all my pretty flowers but when I sew them they are all bunched and puckered… what am I doing wrong?? ?